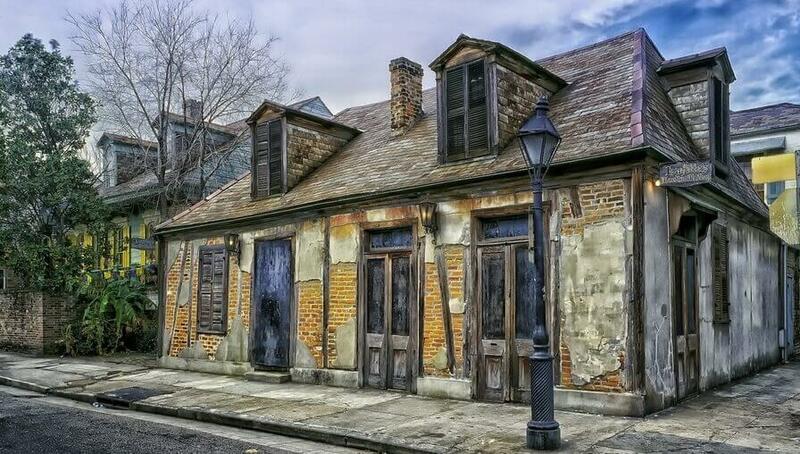 As a tourist stepping into New Orleans, it is like stepping into another world. Unlike any other city in the United States, this city has a unique identity steeped in its vibrant Creole culture. The cobbled stone streets, the black wrought iron railings on balconies, the brightly colored buildings all showcase the rich history of New Orleans. Perhaps what New Orleans is best known for is the annual festival of Mardi Gras. 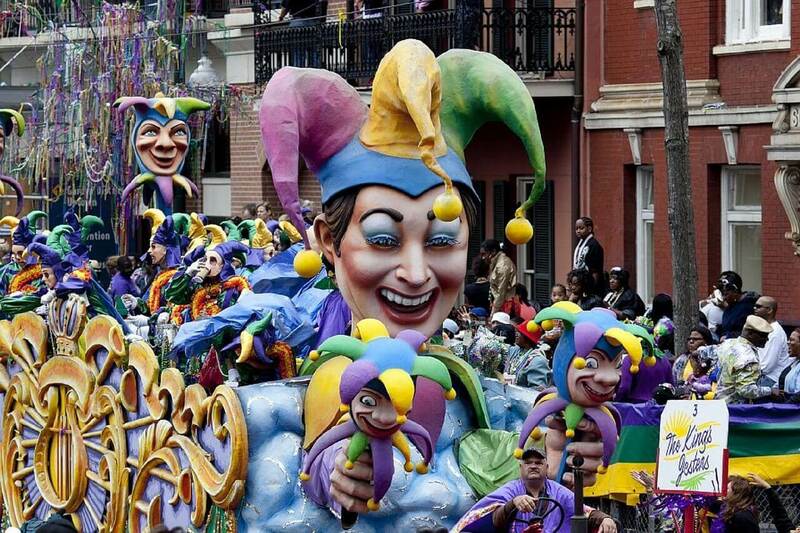 Mardi Gras translates to fat Tuesday in French. New Orleans has been celebrating Mardi Gras since 1837. The Mardi Gras colors are purple, gold and green. Purple symbolizes justice, gold stands for power and green represent faith. 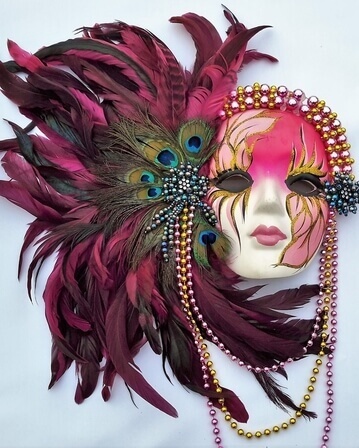 Mardi Gras marks the end of carnival season and the beginning of Lent; a time of fasting. The parade is all privately funded by krewes. Once secret societies, the anonymous society members pay dues and meet to fundraise and plan the annual parades. Since the 1870s the tradition of stuffed animals, beads, cups and more are thrown to the crowd from the floats in the parade. On February 24, 1857, the first parade for Mardi Gras was held in New Orleans. Another tradition of Mardi is the King Cake. It is a coffee cake with cinnamon sugar, topped with purple, gold and green icing sugar. Whoever receives the piece of cake with the plastic figurine of baby Jesus, is destined to have a good year and is responsible to host next year’s Mardi Gras party. The masks were worn on Mardi Gras originally encouraged uniformity amongst classes and allowed everyone to forget about social status and freely socialize during this festive time. It always falls on the Tuesday before Ash Wednesday. This year Mardi Gras is on Saturday, March 2, 2019, and the festivities will continue throughout the weekend. Family Mardi Gras will take place from Friday, February 22- Sunday, February 24. This is a free celebration held in Metairie with live concerts and carnival festivities. Pack layers. The weather may fluctuate from chilly mornings to sunny warm afternoons. Most festivities are outdoors so pack comfortable shoes and casual outdoor clothes. If rain and thunderstorms are in the forecast, be sure to pack a raincoat. Lastly, pack a costume - the sky's the limit. Be creative! What are the main events of Mardi Gras? The two largest parades, Bacchus and Endymion, are on the Saturday and Sunday before Fat Tuesday. If you can extend your weekend stay, Monday the Orpheus parade takes place and Tuesday the Zulu Lundi Gras festival is an all-day event. Another activity you can plan for Fat Tuesday is touring the French Quarter and enjoy seeing everyone wearing masks and costumes. During Mardi Gras, the French Quarter is closed to vehicular traffic. Surrounding parking lots will be reserved early and tickets will be very expensive during the Mardi Gras season. Taxis are difficult to find as well. Plan ahead and study a map of the surrounding neighborhoods and parade route times. While Public transportation is an option, during Mardi gras changes are made to routes and schedules. Your best options are walking or biking. If you're biking be sure to bring a lock if you plan to leave it in a public area. Open alcoholic containers are okay to carry in the streets. Make sure not to carry glass containers. Park responsibility to avoid parking tickets and having your car towed. Arrange a meeting place with your party in case you get separated in the large crowds. Plan to arrive 4 hours prior to the parade in order to get a good location along the route. Be careful around the floats. Don’t run into the street after thrown trinkets. Wait until the floats have safely passed before picking up trinkets from the ground. Make restaurant reservations ahead of time as everywhere will be packed. Street vendors might also be an option for quick eats. If you are looking for more inexpensive options, pack your own snacks, sandwiches and water bottles. Don’t forget to include wet wipes or hand sanitizer! FlyCheapAlways finds you savings on airline tickets and hotels around the world. We at flycheapalways compare fare from 700 airlines and 200 travel agencies to find you the best low fare flights. We are continuously working to find you the best travel deals and offers to enjoy more and save more on your trip. Get updates about about latest offers/deals to save up on your next trip. Search Flights, Hotels, Car Rentals! FlyCheapAlways is a fast growing online search engine for flights and hotels, finding the cheapest flights all over the world. We search over 700 airlines and 200 travel agencies to find you the best low fare tickets. Use our advanced search and filters to book the flights which best suit your needs. FlyCheapAlways is a free service and we only partner with agencies with the best reputations.